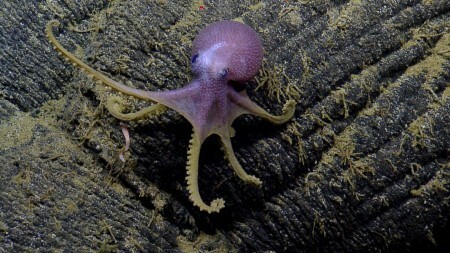 Two hundred thirty miles northeast of the Galápagos Islands on the Exploration Vessel Nautilus, Robert Ballard, the famed marine explorer and our team leader, was bouncing and squirming like a kid in his last few miles on the way to Disneyland. It was the 72-year-old’s first time back to the hydrothermal vents he had discovered on the ocean floor nearly 40 years earlier. We had arrived at a spot 8,000 feet over the vents, and team members went about their work with an eager efficiency. The navigator sent precise, clipped requests to the bridge, adjusting the massive ship mere feet at a time. 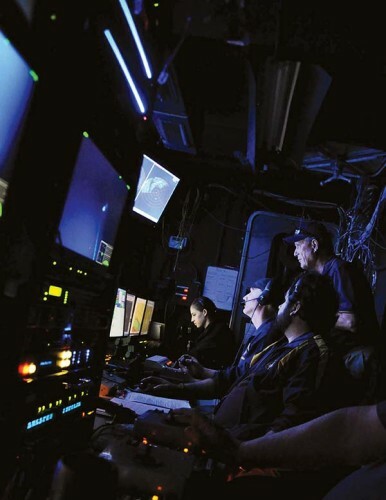 Working in tandem, pilots of the remotely operated vehicles (ROVs) performed a dance of delicate maneuvers, some of it from muscle memory and some of it in response to feedback from sonar, high-definition video and sensors aboard the ROVs diving beneath us. Two seats to the left in the ship’s nerve center, or control van, I manned the communications station, fielding questions that came in via Internet as people in homes, schools and workplaces around the world participated in this historic moment live. I was able to join the extraordinary expedition because, this year, I am serving as a science communication fellow with the Ocean Exploration Trust (OET). As a fellow, I journeyed aboard the Nautilus from Panama to the Galápagos, participating in global outreach and education during dives and special live interactions. My stay on the ship lasted for a little over three weeks in May and June. We left Panama in search of an incredible alien ecosystem beyond the reach of sunlight, one that I first learned about as a biology student at Cal Lutheran. Called hydrothermal vents, these are places where cold ocean water seeps down through cracks in the Earth’s crust, becoming superheated as it approaches magma under the surface. Along the way, the water absorbs a variety of chemicals from the surrounding rock before it re-emerges as a deep-sea hot spring. Bearing a toxic mix of hydrogen sulfide, heavy metals and other compounds, the vents would be classified as highly dangerous and worthy of a Superfund cleanup if they were located on land. Upon finding the hydrothermal vents in 1977, Ballard and his fellow explorers made an even greater and still more surprising discovery: a riot of bizarre, fascinating, and sometimes huge creatures that called the vents home. formaldehyde had been brought along on the voyage. chemosynthesis, in which chemicals emanating from the vents are used by bacteria, both in the water and inside the bodies of other organisms, to provide the energy necessary for life. The discovery of this ecosystem set off revolutions in thought about the variety and the origin of life on our planet, and about the search for extraterrestrial life. Put simply, it was a game-changer. Now that I am back home from my journey of discovery, I’m working to inspire young people, especially girls, to pursue careers in STEM (science, technology, engineering and math), because this is a crucial need for our economy and future workforce. I continue my teaching and outreach for OET mainly through my regular job with the Girl Scouts. In 2014, women made up 47 percent of the U.S. workforce, but only 27 percent of the workforce in science and engineering. When women do pursue careers in science-related fields, we tend to concentrate on the biological and medical sciences, forgoing studies in computer and mathematical sciences and engineering. This imbalance is more dramatic for underrepresented minority women, who earn only three percent of bachelor’s degrees in engineering, five percent of bachelor’s in computer science, and six percent of bachelor’s in the physical sciences. To visualize themselves in STEM careers, girls must be offered educational paths and must also see women in these roles serving as mentors and models. In addition to utilizing formal and informal educators, such as me, to help in this regard, girls need more internship and research opportunities like those offered by OET. I was impressed by the young women serving as interns in the ROV engineering, navigator and video engineering positions. Inspiring the next generation and making fundamental discoveries, though these are wonderful goals, form only part of the rationale for mapping and exploring the oceans in the kind of detail that we did this summer aboard the Nautilus. For example, many of the valuable mineral deposits mined on land today, such as copper, iron and zinc, are believed to have been laid down in the ocean floor by hydrothermal vents millions of years ago. Understanding these processes could help us to pinpoint deposits of vital resources. As a biologist with strong conservationist tendencies, I see other benefits to exploring. I am concerned about the health of the oceans, declining marine biodiversity and the exploitation of resources. 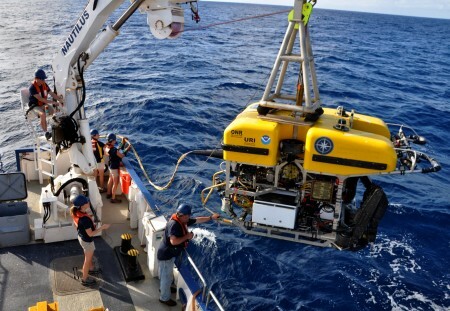 The biologist in me wants to make sure that we have taken the “before” snapshots needed to establish a record of baseline conditions at hydrothermal vents and other regions. If we are to act as responsible stewards of the ocean realm, we must understand more about its nature. To track changes within this realm, we must know what the starting point looked like. Exploration for its own sake also resonates with me. It amazes me that there are still places on Earth that have never been viewed by human eyes. In fact, when you consider that 71 percent of our planet’s surface is covered by oceans, and take into account the vertical expanse of the water column throughout that vast space, it could be argued that most of our planet has never been seen by human eyes! As many have observed, we know more about the surface of the moon. When I graduated from Cal Lutheran 20 years ago, I never would have predicted the course my life has taken. I do know, however, that three big ideas grabbed my attention then and shaped the way I looked at the world: Darwin’s visit to the Galapagos Islands in 1835 aboard the HMS Beagle and his subsequent views on evolution and living things; the theory of plate tectonics and how its forces shape our planet; and the discovery of hydrothermal vents and of the unique organisms that call this extreme environment home. In the years since graduation, I have enjoyed sharing these ideas both as a classroom teacher and as an informal educator working in the nonprofit realm. Still, I had no idea that the three big ideas would come together in one place and time and one journey. To walk in the footsteps of Darwin and Ballard in the Galapagos and over a strange world born of tremendous forces was an experience beyond my imagination. I can only hope it will inspire others to explore and discover as well. Melissa Baffa ’95 is vice president of program and volunteer services at the Girl Scouts of California’s Central Coast. 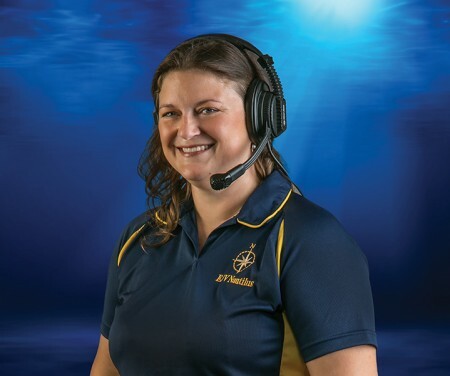 She made her voyage on the E/V Nautilus as a science communication fellow with the Ocean Exploration Trust.